4,5 or 7 nights with all the comforts the Karwendel has to offer. This package includes our ¾ comfort board and the use of the hotel's swimming pool and sauna landscape (also for children) and the new SKY-SPA (16 years and over) with a total of 2,800m² exclusively for guests. Also included are the sauna show infusions of our sauna expert in the SKY event sauna, 2 times a day, 5 days a week. 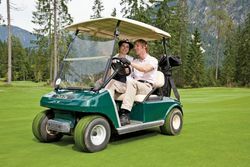 Rent the hotel's golf cart and drive comfortably from the hotel to the golf course, play your rounds in our luxurious cart.